← Get your bliki on! 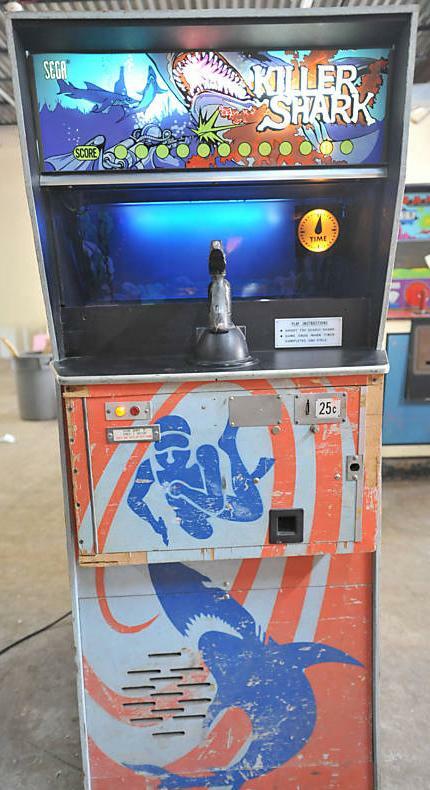 Jerry and I got to talking about classic arcade games yesterday (as we are wont to do along with 1980s music) and the 1972 electro-mechanical game Killer Shark came up as a topic of conversation. 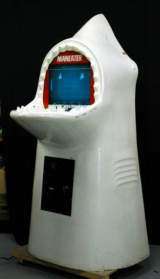 Killer Shark represents a brief moment before the imperial rise of the video game, yet the cabinet was fully representative of the aesthetic of video games to come. The reference to Sea Devil above is relevant, because that is actually the game I played while growing up at the local arcade (and I literally did grow up there). My first exposure to Shark Attack came during a brief cinematic foreshadowing in Jaws (1975). I went back to the archive in order to give anyone who may not have remembered the fascinating aesthetic of this game -in many ways both haunting and gruesome. The shark moves lightening fast (not unlike the genetically engineered in Deep Blue Sea) through a series of flickering slides and when the harpoon hits, the blood flows freely as the shark writhes in pain. The images are pretty powerful, and thankfully the time machine of the movies preserves it all in beautiful Technicolor! This entry was posted in fun, video games and tagged arcade games, gaming. Bookmark the permalink. So, given up on beating Joe in PacMan and reverting to Sega’s Killer Shark, when EVERYONE KNOWS that you couldn’t beat ME in Sega’s Escape from the City Sonic the Hedgehog game. I am very disappointed. Hey listen, you, I have real life experience at escaping from cities. 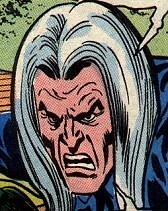 And I’ll challenge you to a game of Sea Devil any day of the week, afterwards we can play a little skeeball! How’s that for old school 2.0? Wow, that takes me back! That was such a cool game! Sincere thanks and respect to Loressa for diminishing my frustration regarding the fact that, not being a “videogame” per se, Killer Shark won’t be seen in MAME anytime soon. The link is down !!! Can someone tell me where i can download the game ? Pleaaaaaaase !!! !